What is Keyword Research and How Do You Do It? Answers Here. It is one of the main drivers of organic growth for your business, and for a business owner, it needs to be a purposeful decision in your digital marketing plan. What is keyword research should be an integral part of your Search Engine Optimization (SEO) plan. SEO is the process of optimizing your website to rank higher on SERP’s. It is a long term strategy to effectively improve organic traffic towards your business. Improving your visibility on Google makes you more readily found and doesn’t bottleneck your digital marketing efforts. SEO follows Google’s algorithm to nail down best practices to help your web pages gain visibility. It comes down to how your design your site and how credible you have built your website to be. SEO is not a one size fits all approach and you will need to figure out your goals are going forward. Do want to generate pure traffic? Do you want to maximize conversions? Are you trying to rank the highest on a SERP? These will determines what keyword research you will be targeting and how you will design content. You are trying to balance volume with competition. Thankfully, we have written plenty of articles to help you grasp SEO strategies. We have even written on how to stay competitive in the SEO game. If you know that improving your website’s SEO is the next step in your marketing plan and you would like to discuss how you can reach your goals, contact us. We have helped countless businesses rank higher and achieve more traffic through our SEO services. Ultimately, your job is to produce quality material that provides value to the user’s searches through keywords you have targeted. That is why keyword research is one of the most effective ways to help improve your SEO strategy. This will ultimately translate into tomorrow’s revenue. How Does Keyword Search Impact My Business? What is keyword research is the meat and potatoes of SEO. So what is keyword research? By targeting specific words and phrases when creating content for your website, you can rank higher for those searches on a SERP. Incorporating them into URLs, headers, and written content tells Google’s search algorithm that you are trying to provide valuable information for a specific set of keywords. This is where being a credible authority will pay off. You can also bid on them through Google Ads (formerly Google Adwords) Pay-Per-Click (PPC) system. This allows you to target specific demographics and keywords to display ads on the SERP’s ads banner. Visibility make or breaks companies, and not optimizing for keywords will make your beautifully designed website go unnoticed. What is keyword research trying to accomplish? It will give you insight into the market by helping you find where the demand lies. 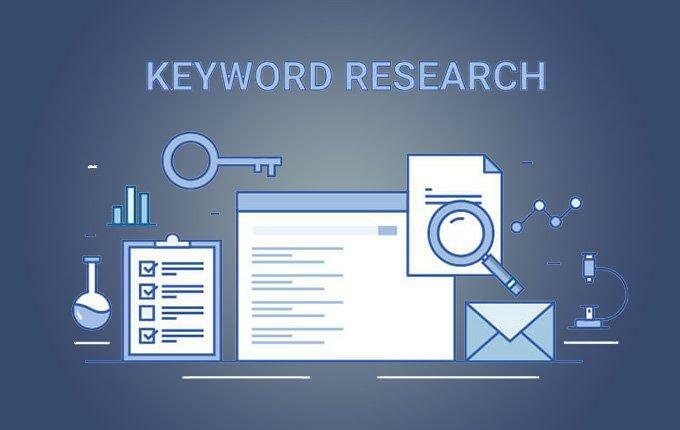 Now that you know a little more about what you are getting into, let’s begin dissecting what is keyword research and how to do it. You need to begin with brainstorming what people will be searching to land on your website. There exist keyword planning tools, such as the ones provided by Google, but it is ultimately up to you to determine the value of a keyword. Are you making content that answers what keywords are searching for? Will this traffic end up in a purchase? Will I be visible targeting this keyword? These are all important questions to ask yourself. Looking towards your competition isn’t a bad idea either. If a search has a lot of ads in the ad section of a SERP, the keywords may be a good converter. Take a look at Google’s ‘FAQ’ the ‘People Also Ask’ section. These are the go to searches people branch from your search term. Check out Google’s suggest before you complete a search. Go through a Wikipedia page on the topic. Their subheadings and internal links may provide insight into relevant niches. Look at how forums specific to the industry divide up topics. Your goal is to figure out the typical consumer pathway that inevitably leads to a conversion. Other keyword planning tools can provide even more valuable metrics such as keyword difficulty scores and popularity. It is pertinent to understand what your keyword difficulty will be. If the fight for authority is going to be an arduous uphill battle, you may want to choose lower difficulty keywords. Keywords can also be phrases as well. We call these long tail keywords. This can be the difference between searching for ‘truck’ and ‘Ram 1500 Crew Cab 2012.’ These kinds of searches have lower volume but make up the majority of all internet searches. Quantifying intent will be your goal when selecting keywords to take action on. Long tail keywords tend to be much more specific and at that point when the person is ready to convert. It is going to be a balance of volume & relevancy. Long-tail keywords can work against you if you try too hard to rank for too many long tail searches with minimal volume. They should be a supplement to a strategy that includes growing authority in higher volume keywords. When performing keyword research, it’s important to be aware of buyer personas. This will translate into high intention searches which is where the value lies, beyond generic search terms. This will require you to present relevant pages for each high intention search terms. Google will knock your pages for high bounce rates. In other words, if you provide valuable yet irrelevant information for a set of search terms and your users frequently back-button out, Google will take note. For example, someone searching for ‘where to buy shoelaces’ would most likely respond to a page selling sneakers vs. a page on the history of Jordans. Likewise, someone searching for something broad like ‘basketball’ may be interested in pages such as ‘Laker’s Highlights’ as well as ‘How to shoot a free throw’. This is why you need to be aware of where people are in the conversion funnel and their search intent. Once you have nailed down a list of good fundamental keywords, then its time to start testing them. Optimizing your keyword list will be part of regular maintenance. It needs to be done frequently enough to produce content and stay on top of trends. You may go ahead and produce content and ads for home run keywords, but for the more niche or specific ones, thinking about using sample campaigns. Google Ads (formerly Adwords) lets you launch sample campaigns with test traffic to track impressions and conversion rates. Nonetheless, it is important to test all your keywords. Try assigning a value to each impression which turns into a visitor that turns into a conversion. Be mindful of click through rates and try to calculate the revenue per user/visitor/customer. What is keyword research isn’t just about the volume of a search. Its about how much of a conversion rate it brings as well as how much revenue that can generate per volume. It’s important to be mindful of competition as well. Using tools such as MozBar, you can look at domain and page authorities for a specific search terms. Carving out a space out of high volume terms will be hard. Its much easier to find your niche. That’s why aiming to rank for ‘shampoo’ will be more difficult and less profitable than perhaps ‘organic tea tree oil shampoo.’ Unless you plan to become an overnight shampoo authority, try to keep your keywords specific to you. When you know the domain and page authorities of competitor sites, you may want to see how your own stack up. If you want to rank page 1 on a SERP you will have competition. Either way will build your credibility to Google and allow you to rank higher. To increase authority, you will want to undertake some major SEO strategies. By improving SEO, generating back links, and providing the most valuable content per search, you will increase your rank on Google’s SERP. You can also incorporate latent semantic indexing (LSI) keywords into your keyword specific content. These are supporting keywords that are frequently found with the parent keyword. They make your content appear my in-depth to Google. To find lower competition searches, try aiming for more long-tail keyword or find markets that have little to no competition at all while still retaining a decent search volume. Analyzing the metrics of your keywords may be difficult but will be the insight you need to optimize your strategy. Using just Google Analytics or Google Search Console, you can track key metrics such as unique visitors, sessions, page views. For keywords you would like to convert with, track things such as bounce rate and page duration. You want to isolate niches with high conversion rates above all. Try measuring the pathways through your site. You can find where people are getting stuck or bouncing or what pages have high click-through rates. Keywords are also used in Google Ads for their Pay-Per-Click (PPC) service. Using the same keywords you would like to rank for, you bid on them in Google’s PPC system. This will put your page in the Ads section of a search and you will only pay per click. This is a great system for businesses because you will only pay for successful clicks which helps make it budget friendly. It’s a quick way to launch digital advertising campaigns. You can specify demographics and search terms as well as the amount you are willing to pay for a click. Here we discuss further how PPC can help grow small businesses. It eliminates wasted advertising budgets and is free visibility in search results pages. Google can use smart targeting to help you reach certain goals. They even detail the different ways they can help your business reach your goals. Think about hiring a professional team to help you implement PPC management services. By optimizing your keywords, your business can carve out a space in Google Search Ads, Google Remarketing Ads, and even be part of the Google Shopping banner. Each have their own use cases that can be tailored to your business. Contact LYFE Marketing to see how your business could benefit from Google’s PPC. What is keyword research in the context of SEO is providing valuable blogs and media relevant to the topic. By providing credible, quality material, you will rank higher for the searches that you target. It is not a pay to win system like Google Ads PPC and is more of a long term strategy to be an authority in your niche. However it is a bit of art to targeting the right keywords in competitive markets. At the end of the day you are trying to design content around popular or even niche keywords in your industry. Whether this be through blogs or your product landing pages, it is your job to build authority on a topic. You also need to be aware of the technical side of SEO when it comes to your keywords as well. If you think your website could use a tune up, or you would like a SEO assessment consultation, think about reaching out to LYFE Marketing and asking about our SEO services. We help businesses of all size rank higher and get more visibility out of their websites. At the end of the day, the digital marketing space is always changing. To be on top, you need to be adaptable. Especially when it comes down to what is keyword research, you need to stay agile. It is the fundamentals to your website’s foundation and will require regular re-evaluation. Keyword research can be done whenever you are trying to add new content or fill out a specific niche. Search language will constantly change so it is important to stay on top of industry trends. So hopefully now you understand what is keyword research? If you don’t think you’re up to the task of implementing deep market research. That’s OK! People specialize in this because it is something that can take business growth to the next level. If you think you would like a third-party’s help on implementing better SEO practices or managing a PPC campaign, then don’t hesitate to reach out to us. Our specialists will guide you through a free consultation on how our services can help provide consistent and quality growth to your business.